Pokeys are enemies debuting in Mario vs. Donkey Kong: Minis March Again!. Although harmful at direct contact, they are passive to the player and only travel from one side of a platform to the other. Unlike Shy Guys, who display the same behavior, Pokeys are taller, which makes them more difficult to avoid in certain situations but also prevents them from getting into narrow passages. They are always composed of three segments, one of which is their head. In all of their appearances, Pokeys can be defeated when struck by a hammer. 1.1 Mario vs. Donkey Kong: Minis March Again! 1.2 Mario vs. Donkey Kong: Mini-Land Mayhem! Here, Pokey toys are first encountered in Room 3-3 of Magnet Mania. Activating a yellow switch transforms them into three harmless and immobile blocks. Their second appearance is in Mario vs. Donkey Kong: Mini-Land Mayhem! where they begin showing up in Area 8-3 of Super Skywheel. If Pokeys come in contact with the transparent yellow Pokey Blocks, each segment will fill them in. They can be defeated if shot by a Mini in a cannon. They reappear in Mario vs. Donkey Kong: Tipping Stars, where they are introduced in Level 5-3 of Dashing Desert and continue to appear in later worlds. Aside from Hammers and Cannon shots, Pokeys of this game can also be defeated by sliding down on them from a slope. While this is not shown in any of the game's pre-made courses, it can be tested in the level editor. 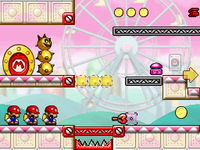 ↑ "Pokey – Pokey will move back and forth, blocking Mini Mario’s way. Step on a yellow color switch to turn Pokey into blocks, or use a hammer to take him out." - Mario vs. Donkey Kong: Minis March Again! help. This page was last edited on January 23, 2019, at 12:47.